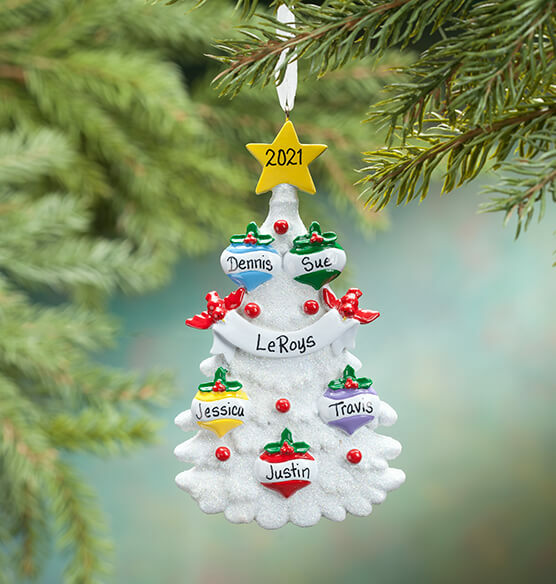 Brighten the family tree with this personalized White Glitter Tree Ornament. Mimicking the shape of a holiday tree, this ornament sparkles with colorful tiny painted ornaments. 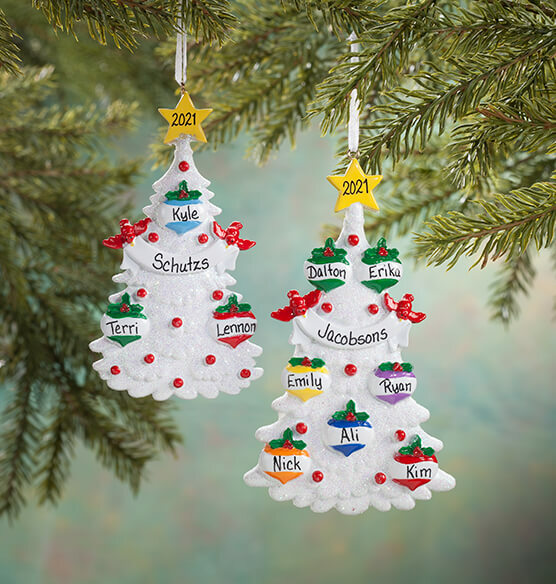 Each finely-detailed ornament showcases the names of family members. Specify first names (limit 8 letters/spaces each). A garland displays the family name. Specify last name (limit 12 letters/spaces). The year appears within a yellow star. Specify year (limit 4 characters). 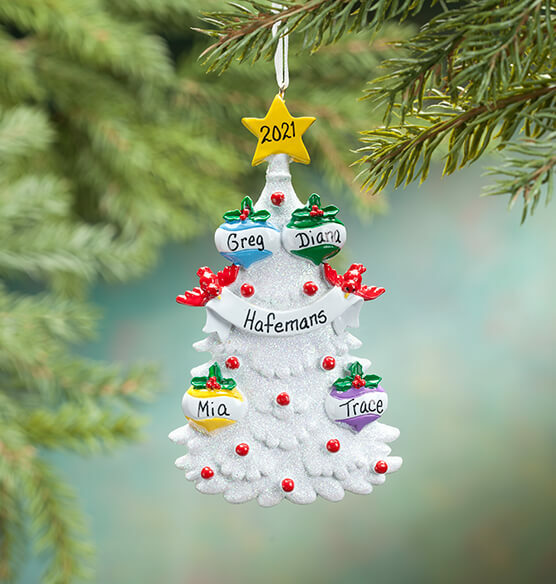 We make it easy to create cheerful customized ornaments for family gifting. Ornament is crafted of resin. This was a gift and it was a hit. I heard my daughter say (I Love This!) who bought it for me. I bought 6 different ornaments with different names on them all. Each one was an absolute treasure. One cuter than the next. Everyone that got one, just loved it. Would definitely buy again. I ordered this to give to my daughter and her new husband as they blend their new family. The only issue I have was that I didn't have the choice of how to place the names. I would have put the shortest name in the center between the two longer names for balance. It's very pretty though so overall I was pleased. Purchased this ornament for my Grandson & family. They put on their Christmas tree immediately. When I looked at it my comment was WOW. Very nice. This Christmas ornament is so beautiful! it was pretty in the catalog and even more sparkly and when it arrived. I'm sure my daughter's family will be most pleased with it! I always buy my family ornaments from you. Have made this purchase for 15 years, it is a tradition to give an ornament to each family every Christmas. By purchasing early I saved money. My daughter is going to absolutely love these and be able to cherish this for years. And someday, she will be able to pass them on for a family tradition. Was very happy with this ornament. I ordered 3 of the white Christmas tree ornaments and had them personalized. They are fabulous. The catalog does not do them justice. I would definitely order again. Every ornament I bought here was just as I expected. Always happy with whatever I get from Walter Drake. More beautiful than the picture. I'm very happy with it and know my niece will love it. Nice gift for our children and their families. This ornament is super cute. We are a large family of 7 and many years ago, I started a yearly famiy ornament. You can imagine (we've been married 15 years) we need a variety. I was super excited Miles Kimball now offered this ornament as a white tree. It is hard to find a family of 7 ornament so I am happy. The first one I received was broken, so I called customer service and he promptly sent me a replacement. These are good ornaments to give to my children and grandchildren. This item makes a very nice decoration of memories on someone's Christmas tree. I order several of these each year for family - all personalized with names. 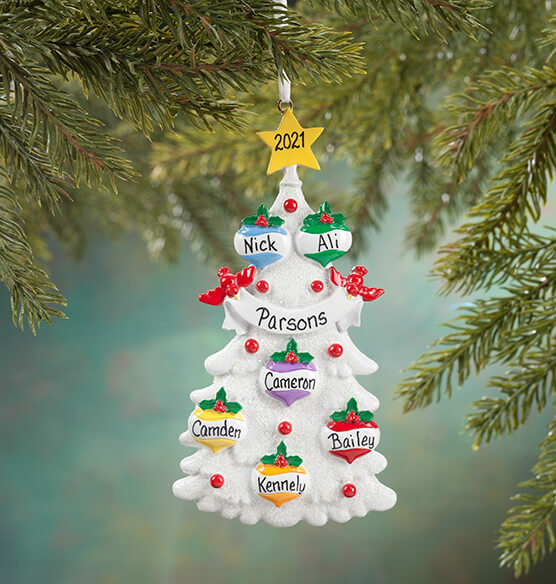 Miles Kimball always has a great selection of choices, and the grandchildren LOVE getting these, and helping to put them up on the tree each year! Always very pleased with these purchases. Very pretty but only gave 4 stars because it took 3 weeks to receive ornament. I bought 5 of these ornaments, four of them were for gifts and one for myself. I love the ornament and was very pleased with the looks of the ornament, however, I think it was defective or of poor quality because the little hook that has the ribbon in it to hang the ornament is definitely not put in the ornament securely therefore on two of my ornaments the little hanger came out as I was removing the ornament for the packaging. I was pleased that I was refunded my money for the 2 ornaments that were of no use. I am always pleased with Miles Kimball and their policy. I have been doing business with them for years and not just at Christmas time. I would recommend this ornament to a friend because of it's beauty and other people may not get a bad one. Three of my 5 orders were okay. I am very pleased with the appearance of this ornament, but so disappointed that is wasn't packed more securely. It arrived with one of the cardinal's wings broken off. The personalization is very easy to read and looks wonderful. I love the ornament for a first time family and pets. i have a child with a 9 character name, can you squeeze 1 more letter? BEST ANSWER: Thank you for your question. Unfortauntely we are unable to add more characters to a name. We hope this information will be of help to you.